Last weekend “Odin Den” (“One Day”) AdVita Foundation charity festival was held in Saint Petersburg. Svetlana Surganova and Yuriy Shevchuk performed their unique programs at the New Stage of the Alexandrinskiy Theater. AdVita charity foundation was created back in 2002. It has been helping people suffering from cancer for 17 years. The Alexandrinskiy Theater hosted “One Day” festival and it raised more than one million rubles. The funds will be used to help the wards of the foundation. “More than one million is raised. We’ll know the exact amount when all the money is on the foundation’s account and in the donation boxes. Of course, on the one hand, some money will be spent for medical treatment, on the other hand, some funds, by all means, will be transferred for payment of costs of the blood samples typing to the national registry of bone marrow donors”,- said Elena Gracheva, administrative director of AdVita foundation. 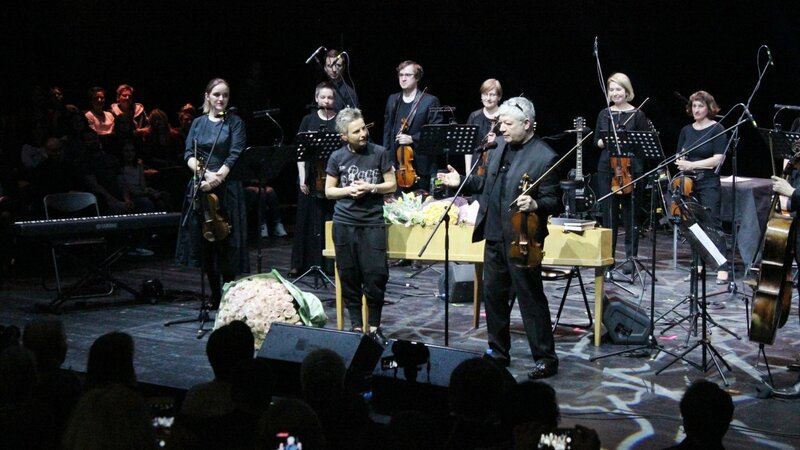 A special exhibition dedicated to the famous St. Petersburg charity foundation in the foyer of the Alexandrinskiy Theater and three concerts were organized within the frames of “Odin Den” festival. The evening was opened by pianist Polina Osetinskaya and writer Lyudmila Ulitskaya. Further, on the New Stage, Svetlana Surganova performed to the accompaniment of “Divertissement” Chamber Orchestra from Saint Petersburg. The program had two parts, a poetic and a musical one, too. The artist admitted that she was nervous before the performance, despite the vast experience and warm welcome of the audience. “A very good audience: a very grateful, thinking, very conscious audience. It is a great joy, great responsibility and a great honor to perform for such an audience. It’s long time since I was as nervous as before today’s going on stage. Of course, it also was due to the experimental program, we presented it for the first time in this way, with “Divertissement” orchestra conducted by Ilia Ioff, the Honored Artist of Russia. It was an amazing experience for me. In my opinion, everything’s turned out today: it was musical, interesting, soulful and conscious”, – Svetlana Surganova said. The artist also spoke about cooperation with AdVita Foundation. She noted that, along with the scope of help, the work of the organization can also be evaluated by the respected people working with it. “When you see real actions, real results, you trust and want to fit into it. There is a very simple principle: if someone asks for your help and you can give a hand, just give a hand. That’s all”, – the singer said. Yuriy Shevchuk, DDT long-standing leader, was closing the charity evening. The cult rock musician sang for more than two hours, although one hour and a quarter was planned for his concert. The artist said it was a long time since he had given a concert in Saint Petersburg. “We haven’t performed in Saint Petersburg for a long time. We are all in Siberia, in the Urals and abroad. Of course, it is necessary. We never present the same program twice in Petersburg, this is our principle, to avoid the spirit of commercial combing,” – the musician said. Yuriy Shevchuk said he was very happy to take part in the AdVita charity event, as this was a real opportunity to help people with his music.